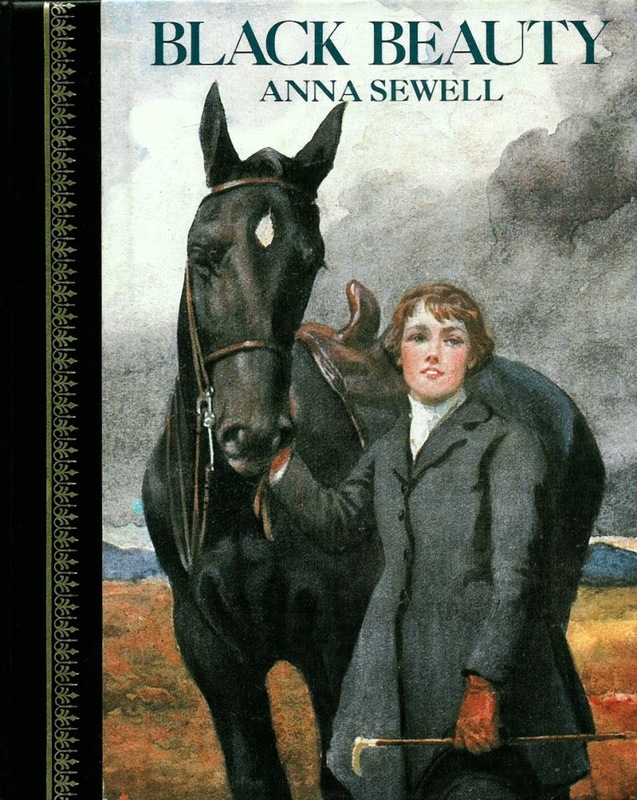 One hundred and thirty seven years ago, Black Beauty by Anna Sewell was published. It completely boggles my mind! So long ago, and still a much loved classic(with much reason to be so). I was a huge horse lover growing up. I took riding lessons for two summers, subscribed to Horse Illustrated, plastered my walls in horse posters, and read the Saddle Club and Thoroughbred series. And King of the Wind and Misty of Chicoteague and Man o' War and The Black Stallion series. At one point I was the almost-owner of a twenty-one-year old Arabian mare. It fell through, but I can still remember buying grooming equipment and being so excited that I was going to realize my dream of owning a horse. 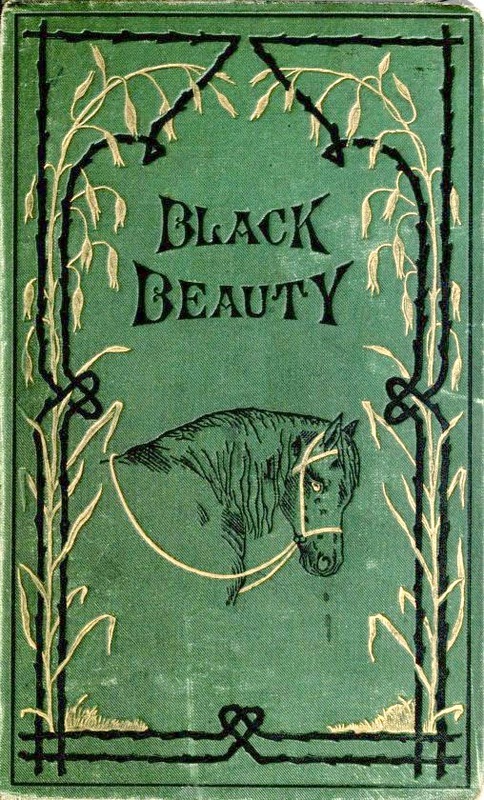 With my horse craziness, Black Beauty has always been a favorite. I honestly can't remember if I watched the movie or read the book first, but both made me teary-eyed. 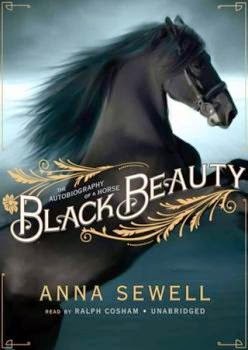 So in honor of the anniversary of Black Beauty, I'm giving away this sketch. I drew this from an illustration I found in my hometown public library's copy of Black Beauty(I can only draw if I have something to look at). If you'd like to own this sketch, as always, leave a comment(and if you'd be so kind as to give us a follow at the group blog I belong to, that'd be totally awesome-- there's a link to it on the sidebar, thanks!) Winner will be announced 10/28. And for fun, feel free to let me know what your favorite breed of horse is. Mine are(like chips, I can't just have one): Arabian Friesian Thoroughbred Appaloosa And for even more additional fun(there's just so much today!) 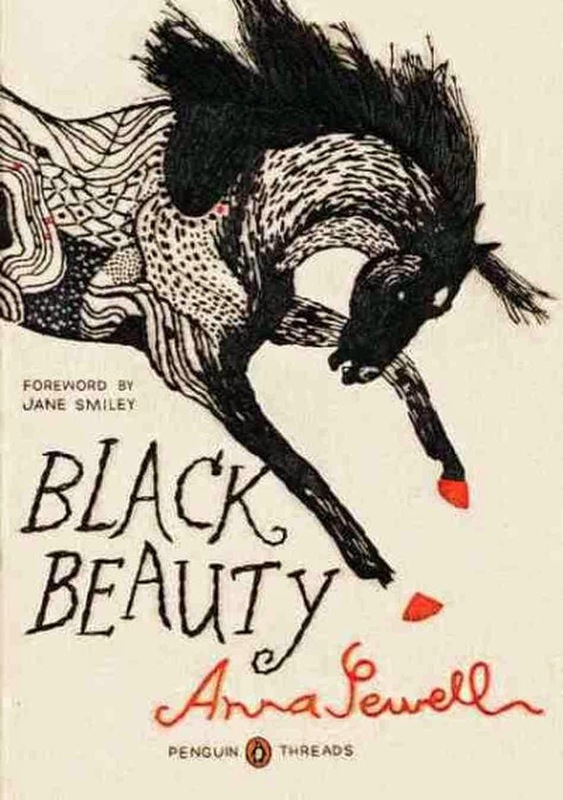 also feel free to mention which of these Black Beauty covers is your favorite. 1. It is no secret that I want to become a published author. It's one of the reasons that my blog is named after... well, me, instead of having a title like Book Rambles or something along those lines. By using my name, I'm trying to create a brand in the hopes that one day I'm going to need one. So while I'm putting in the work for that to happen(some days I'll admit, better than others) there are two things that have occurred that are the next best thing to seeing my name on a cover. And that's being mentioned in a book's acknowledgements. There's nothing like opening up a real-honest-to-goodness book, and reading your name on the page. Makes me happy! The first time this happened was for Claire Merle's, THE GLIMPSE. I loved reading it and giving my thoughts on it. And Claire had me in awe more than a few times with her way of describing things. The second time was for Kimberly G. Giarratano's, GRUNGE GODS AND GRAVEYARDS. (Mmm, I seem to be on a G-kick here...) Being my oldest CP, Kimberly's no stranger to you all around here. In fact, you'll be hearing from her next month on some of the wisdom she's gleaned while experiencing her debut. I'm really looking forward to that post! Anyway, one other thing before I go fold some laundry and do dishes(no warm fuzzies w/those two things). I was recently mailed an ARC that I had no idea was coming. It arrived w/another book that I was hoping for(YAY!). So this is a book that I have little interest in the subject matter, which is Greek mythology. The only Greek mythology books I care for are Rick Riordan's Percy Jackson series. So I'd like to give the ARC to someone who does like Greek mythology, as well as MG books. If this is something that's up your alley, please let me know in your comment and I'll put you in for a drawing on 11/22. Though keep in mind if you do win, it'd be great if you reviewed it after reading, as we all know reviews help w/keeping an author in bread and butter. Thank ya! Thanks, Leandra, for hosting me on your blog today. In addition to being a writer, I am a stay-at-home dad of eight children. Eight children living together in a fairly modest split entry house brings with it a certain amount of craziness. One that I'm especially looking forward to as winter just descended upon Omaha, where we live. It brings to mind a particularly fun week last winter. It started on a Monday morning, when I awoke to a crash and the sound of screaming from the kitchen. I stumbled into the kitchen to see purple stuff everywhere. You really can't appreciate just how far jelly can spread when a baseball is thrown at a Smuckers jar. After spending the rest of the morning finding little specks of glass and jelly throughout my house, I thought and hoped that was the most interesting part of my week. It was not. The next day was a particularly windy and cold day here in the cradle of civilization. And sometime in the afternoon my son ran off the stairs to tell me that my other son had broken a window. I walked downstairs to investigate. Apparently, my son had slammed the door leading from the basement to the backyard and the wind had helped him out so much, the glass above the door had shattered. A mess to be sure, but one I could handle. I walked back upstairs to grab a broom when my front door opened. My nephew was there with presents for my son Daniel's birthday. I thanked him and took the presents upstairs. That's when we encountered Rachel. Ahhh Rachel, what can I say. She is a very special person. She is 5 years old, beautiful, big, and....well, a little high strung and hot tempered. When she saw the presents, here eyes about popped out of her head. "Are those for me?" she asked. "No," I answered. "These are for Daniel, for his birthday." To which she responded, "What!!!!!". Then she screamed, stomped her feet and charged into the living room where she angrily kicked one of her cowboy boots off her foot and....wouldn't you know....right through the living room window. Just shattered it. Two windows broken within 5 minutes in two completely different ways. A new record for my little family and one I hope will last just a bit. So you see, my life and my family are a bit crazy. I write Middle Grade to give my brain an outlet...but I draw on their craziness to help me out. The Beef Jerky Gang is a bit silly, funny, and crazy. 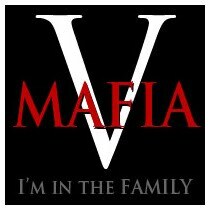 A lot like me and my family. Amazon When Peter Mills descends into the creepy basement of Finley Junior High, he discovers a dark and twisted truth: girls haven’t always ruled the world. Now armed with a book of ancient, forbidden man secrets (such as how to make paper airplanes, stink bombs, and beef jerky), Peter and his friends think they’ve found the recipe to changing their lives. But the boys of the Beef Jerky Gang will soon find out that the girls aren’t about to give up control to a bunch of prank-pulling punks. Join Peter and his friends in this hilarious first book of the Beef Jerky Gang series. I don't know about you all, but a stay at home dad to eight kids and a writer to boot? When does he find the time?! 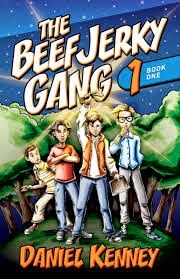 And I love the premise of THE BEEF JERKY GANG, with girls ruling the world-- I could get into that! ;) Though I am a fan of beef jerky. This girl wouldn't have banned that! Also, THE BEEF JERKY GANG is currently a steal at only .99 cents! You've probably seen the 777 Challenge making its way around the blogosphere lately. I've really enjoyed reading these posts. There's something so tantalizing about being offered just a slight peek into what others are writing. So I was more than happy to be tagged by the lovely Vanessa Schwarz and decided to share a bit of a YA paranormal novel that I started several years ago. I love the idea, and plan to finish it, though it's been pushed to the back of the queue by other projects. Someday, my little YAp, someday! Cree scowled and opened her mouth to retort just as a girl walked up. Like us, she’s blonde. Though unlike us, it wasn't natural. She had on a cute lace top, studded with rhinestones, and from the jealous gleam in Coleigh’s eyes, I could tell she approved. “Yeah, that one,” the girl said quickly. To share in the fun, I'm tagging these lovely ladies: Kimberly, Beth, Loni, & Kristin. The idea is you go to page 7 of one of your manuscripts, count down 7 lines, and then share the next 7 lines. Or more, like I did(because I am such a rebel). Also, dear readers, if this looks like fun to you, consider yourself tagged. The more the merrier! Yeah, not really. The proper title for this post should be: I Got A (Fake) Tattoo! Sorry, tricksies! I've gotten a few fake tattoos in swag before, but this one is the only one I've ever wanted to actually put on. It's so pretty! It's a symbol- infinity. There's a cursive word included in the bottom of one of the loops, but I can't read it because one of the girl's short curls is in the way. Before I realize what I'm doing, I sweep away the hair at the nape of her neck. She shudders and spins around so fast that my hand is still midair. Mercifully, Greta whispers, "I thought she was going to punch you." "She has a tattoo," I say, shrugging. "And, I may have touched it." Greta's mouth hangs open, a perfect donut. "Fine. I touched it." If I ever do swag someday, I think I just might include fake tattoos. But like w/this one, I would want it to mean something to the story. So if it was my YA historical fantasy... I think I'd go with an old-timey pistol. For my YA dystopian, it'd be chains. The sci-fi short I just finished would have to be a lizard. And for the MG ghost story I'm getting ready to start, a holly berry and leaf. How 'bout you all? If you were going to pick an image for a fake tattoo, what would best represent your book? I've recently been to several fall writing events(if you missed seeing the others & are interested, they can be found here and here). My latest was the above titled event. It was held at a neat locale, a church's school. 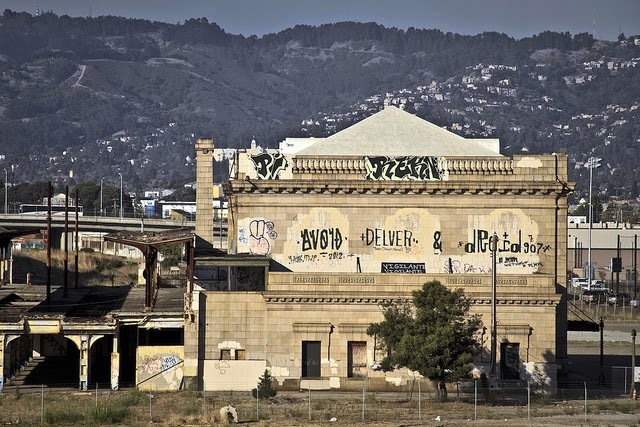 I love architecture and just buildings in general, so it's always a plus for me when the locations are also eye candy. There was a speaker on social media, then we had lunch. The sandwiches(and the orzo pasta I had as a side) were good, though as you can see, I am not a fan of tomatoes and never will be(now ketchup is different. Ketchup is my friend). After another speaker, our regional director, Kristi Valiant, stepped down after four very successful years. There was a lovely speech and some thoughtful gifts. Plus, cake(!) that was delicious. I also got to catch up w/two of my friends that I had met this year at an earlier SCBWI event, Manju Howard & Sam Taylor. Enjoyed chatting w/you, ladies! Then there were books for sale that you could buy and have the author sign if you wished. I picked up LOVE AND OTHER UNKNOWN VARIABLES by Shannon Lee Alexander and WHAT CAN A CRANE PICK UP by Rebecca Kai Dotlich. I got to read some of Shannon's book as I was stuck in traffic for over an hour on the way home(so. 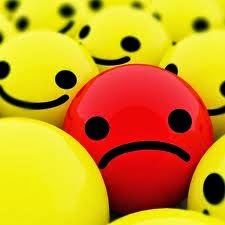 frustrating.) and the voice is super great. And from what I've heard, I'm in for an emotional time w/this book. Meaning: it's of the best sort! Later that night in the car, the kidlet was 'reading' Rebecca's book. So after the book buying/signing period, there was a panel of picture book authors and illustrators. 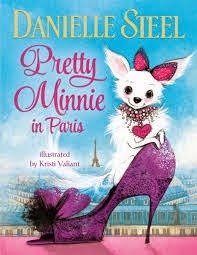 It was really fascinating to hear Kristi talking about going over to Paris to meet Danielle Steele and her teacup chihuahua, Minnie. Kristi illustrated the story, and it looks completely adorable. So my rash of fall writing events is now done! I enjoyed them all and I'm happy there were so many in my area that I could enjoy. Hope everyone has a great start to the week! Today we've a guest post from the lovely and talented Meradeth Houston! *waves* Hey, Mer! Thanks so much for hosting me today, Leandra! 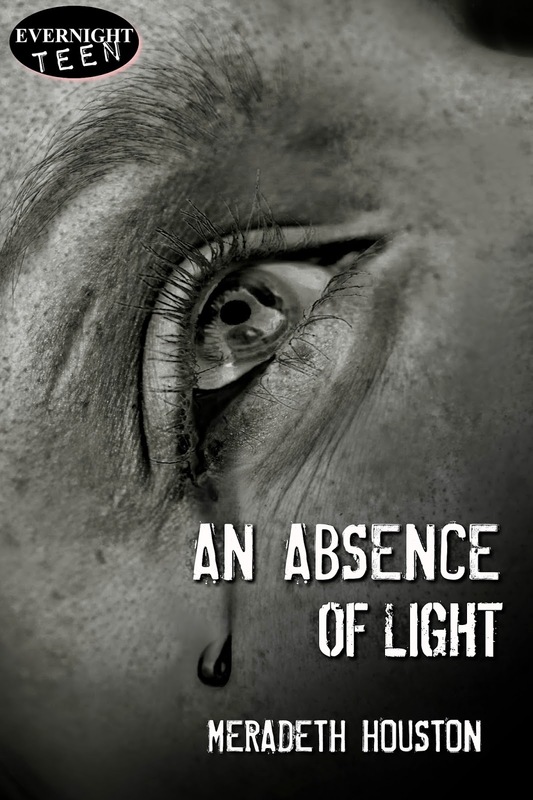 I swear you always have the best guest post ideas, and I was stoked to get to share in that today :) My recent release, An Absence of Light, was a whole lot of fun to write because it allowed me to "go home" while I wrote it. 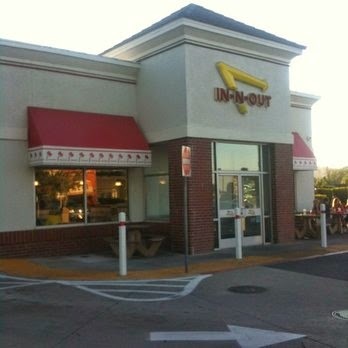 It's set in the central valley of California, in the town of Vacaville, which is close to where I grew up. I took a few small liberties with a couple of the places within the town, and transplanted an auto shop or two, but otherwise I tried to keep the setting as true to life as possible. An Absence of Light has always been Buffy meets the X-Files in my head, but basically deals with Leah being forced from her home by the Shadows--creepy creatures that breed evil and have left her running for her life. 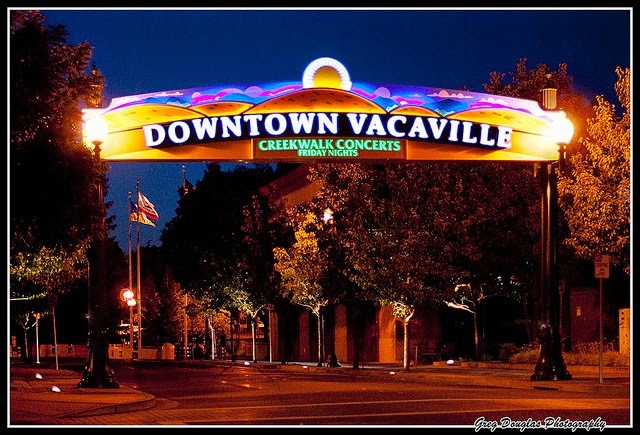 The city of Vacaville, which I have to admit is a pretty unfortunate name (look up the word for vaca in Spanish :), is about twenty minutes from where I grew up and has a whole lot of good stuff to check out. 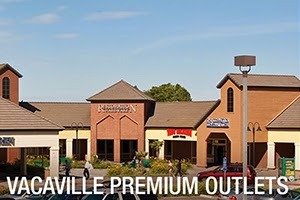 Vacaville also has the best outlet mall ever. No, I'm not joking :) Just ask Leah. Lots of shopping, great deals, and NOT the place to ever go on a Saturday. Or after dark if you're worried about shadows, like Laura often is. One of the places that I look a little license is the auto shop that Laura works at with her fellow Shadow hunter, Manuel. I actually modeled it after Master Tech, a little place in my hometown of Woodland, California. I used to have this car that was always breaking down and I spent a good amount of time there, getting the dang thing fixed. So when Laura walked into my head, loving cars and working for a man who runs a shop, well, this just fit perfectly! Creepy, right? 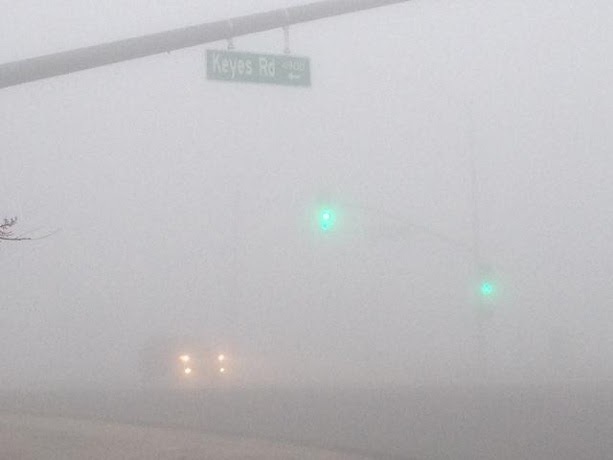 Well, there's also the fog. It's one of those funny things that I remember with a lot of fondness from growing up. Even if it was a pain to drive in! Anyhow, that's part of the world of An Absence of Light. I hope you get a chance to check out Leah, Adam, and Manuel's escapades to fight off the Shadows! >She's a Northern California girl. And now is braving the cold winters in Montana. >When she's not writing, she's sequencing dead people's DNA. For fun! >If she could have a super-power, it would totally be flying. Which is a little strange, because she's terrified of heights. I don't know about you all, but I love cover reveals. Especially if it's for someone that I know through the blogosphere-- like Sarah Negovetich! If you're not familiar w/Sarah, you totally should be. She's an agent for Corvisiero Literary Agency and I always love to read her blog posts about marketing. She has some great tips and tricks, so do yourself a favor and follow her blog. 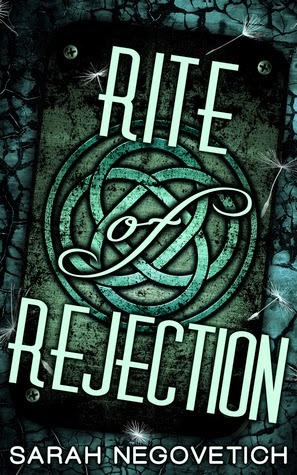 She recently released the exciting news that she's self-publishing her book, Rite of Rejection, a YA dystopian. And isn't this cover awesome?! Before You Stands the Future. The dark-red banner strung across the storefront awning matches the dozens of others lining the streets of the shopping district. Each one with the same clock counting down to Acceptance. Tomorrow morning can’t get here soon enough. I push the glowing blue button and the door slides open with a staccato puff of air. Overhead, an electric bell dings as I shuffle into the upscale boutique packed with other Candidates. Cheryl is right behind me, bouncing on her toes with each step. My mother would die of embarrassment if I showed the same lack of decorum as my best friend, but I’m bouncing on the inside. Our mothers walk in behind us and the door slides shut with another whoosh of air. We visited half the shops in Cardinal City this morning in our search for the perfect dresses and dyed-to-match shoes. I got a thrill buying my first pair of silk gloves, Cheryl and I gushing over the tiny pearl buttons, but this is the purchase I’m looking forward to the most. Shelves bursting with dance cards cover every square inch of wall space. Dozens of girls sigh and squeal over the small books we’ll use to record the names of our dance partners for tomorrow’s ball. I wipe damp palms against the cool material of my skirt and force myself to focus on the goal. One of these books is the perfect one for me. Hopefully, by the end of tomorrow night, it will hold the name of my future husband. You can learn more about Sarah and her books at www.SarahNegovetich.com or follow her antics on Twitter @SarahNego. But I'm going to have to take a break for the next week, maybe two, of commenting on blogs. Perhaps not fully, but with much less regularity. I have never done this, so I feel terrible. But I have two deadlines coming up: one to complete and submit a short story for an anthology, and the second to finish up some minor revisions before I send out a full. I kept telling myself I could still make the blog rounds and write, but it's nothing for it to take an hour, sometimes longer to make it through the my Blogger newsfeed. And that's an hour that I could be using to write. So please forgive my absence(though I will still be active here and on the group blog I participate in). I will be catching up with you all soon though, I promise!